During the historic 2018 Ho-Chunk Nation Labor Day Pow-Wow, our relatives from the Otoe-Missouria Nation came “HOME” in droves to meet their ancestral relatives in Black River Falls, Wisconsin. 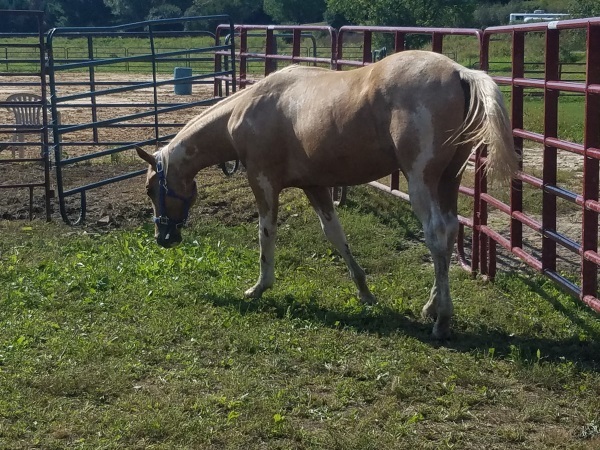 Along with the formal introductions by the leaders of the Ho-Chunk Nation, singing, dancing, meals sponsored by families and clans, storytelling, and extravagant traditional giveaways, was a deeper, more serious gift: they brought with them a sacred gift of life, a Palomino Paint Stallion. At two years old, this special horse, nicknamed “Otoe”, has a gleaming coat of gold and calm brown eyes. He is quiet and likes to listen and watch others. He stands tall and strong, straight and piercing. He is a symbol of the enduring struggle that the Otoe-Missouria have endured to survive removals and transplants to foreign lands, and their long-awaited dream to once again return home to the motherland in Wisconsin. He represents the realignment of two, now-flourishing tribes that once existed as one, before colonization when sickness and wars divided us. Most importantly, he is a symbol of healing, and all that is sacred, from an era when we once gave our most prized possessions to others to promote humility and gratitude. Historically, the sacrifice of a sacred horse as a gift to another was once considered one of the greatest gifts that one could give. Many elders recollected such horse giveaways in the past from the 1930s to the 1980s and then such giveaways, rare nowadays, almost disappeared until recently. About nine years ago, a Menominee tribal member gave Traditional Chief Clayton Winneshiek a paint stallion at the Black River Falls Pow-Wow. Presently, “Otoe” awaits a formal naming by the Ho-Chunk Nation. In the meantime, he is leisurely growing and being gently trained daily with care and love as he matures into adulthood. It is with the utmost gratitude that the Ho-Chunk Nation thanks Mr. Dennis “Punkin” Black of the Otoe-Missouria Nation, Mr. Wilson Pipestem for presenting the Ho-Chunk Nation with such a blessing of life and the freedom that this horse represents.